Dear Cedar Point Paddle Wheel Ride – I Miss You! It’s been a few years since I reminisced about the Cedar Point Paddlewheel Excursions (or the Paddle Wheel ride as everyone I know called it). It will always be one of my favorite rides that is lost, never to be ridden again. I would take a return of that over The Pirate Ride (don’t tell anyone, I’ll get yelled at for that). Last month we made our last Cedar Point trek of the year and toured Halloweekends. We used our son to get into the haunted house that used to be The Pirate Ride. We were hoping for some remnant to connect us to that place and time of loving the ride. Everything was stripped, not even the whale mouth that they could have incorporated into the walkthrough. It was saddening. Every time we look at that building we think back to the glory days of Cedar Point. I say this in the sense that it was our time at Cedar Point. We were the target audience. There was more in the park for everyone, and now the focus is on the coasters. Don’t get me wrong, I love the coasters. The Gemini will always be my favorite, but that is because it was my first. However for season pass holders that didn’t want in crazy lines all day and still be part of the atmosphere, rides like the Paddle Wheel and The Pirate Ride was where it was at. The picture at the top of this post was a feature on the Paddle Wheel. It was hanging out with the steam punk items in Frontier Land. It all came back to me missing the ride. Watching this inventor try to make it to the end of the ramp. That this next time was going to be the time he took to the sky (or the ride would break and we would see it go into the water). My son loves Camp Snoopy. I sit there and look at the waterway that used to be The Paddle Wheel and look longingly for it to pass. That it’s removal was just a dream. We have done the Dinosaur Island a few times. I hope it has made the park a significant amount of money – since they sacrificed the boat ride for that. It was a place I used to go and relax. I rarely ever rode it by myself, most of my friends were into it also. It all started the summer of 1993. One of my female friends was dating Captain D of the Paddle Ride. Because of that we hopelessly looped it, sometimes just riding that ride all day. At some point it became an obsession. A year or two ago I purchased the operators manual for Paddle Wheel excursions. It included how to operate the boat, and the script for the ride. While there were certain parts of the ride that had specific dialogue, the jokes were mostly free form. You could always tell a good captain based on how they deviated from the script. When you ruined the jokes by shouting the punchline, the good captains would know the alternate lines to feed back. It was great when it was a cooperative effort between the crowd and the captain. They still have at least one of the boats. It does tours around Lake Erie. I can’t bring myself to do the extra fee to take it. There are no animatronics. I’m sure the ride is more of a site seeing adventure than a show. I’m sure any witty banter is gone and never to return. That’s the problem though – it’s gone. It’s something I will always remember fondly. 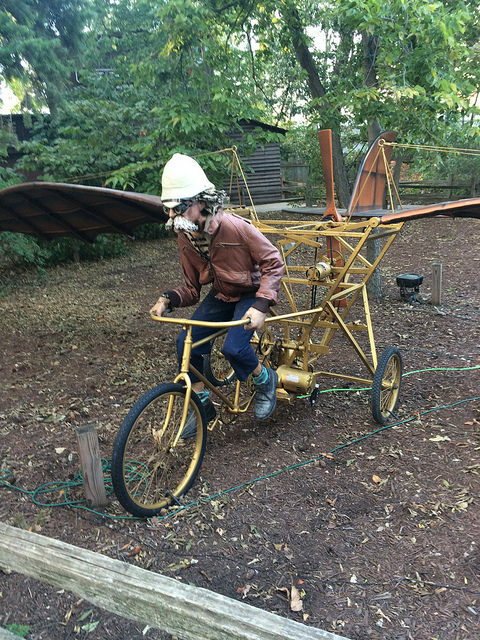 A moment of time that can only be captured and reflected upon – when you see a guy trying to fly a plane on a bicycle. Even though you know it’s never going to happen, part of you deep inside, hopes this is the time. This is the time that I will see it happen. I will hold onto the feeling – that next year is the year it will return. If not, I will hope for all the years after that. Until that time, I’m guess I’m just going to have to sit here and drink my swine cooler and reminisce.